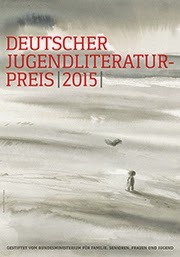 NEWS: NOMINATION FOR THE GERMAN YOUTH LITERATURE AWARD! NOMINATION FOR THE GERMAN YOUTH LITERATURE AWARD! Wonderful news: it was announced yesterday that the German translation of my book DERTIEN RENNENDE HERTJES (THIRTEEN RUNNING DEER) is nominated for the prestigious German Youth Literature Award (Deutsche Jugendliteraturpreis). The book came out at Gerstenberg in a flawless translated by Rolf Erdorf. The exuberant pictures were made by Mattias De Leeuw. In October (Oct 16th), during the Frankfurt Bookfair, the winners will be known. Thanks for all who contributed to this book and congratulations to all the other nominees. More info is to be found here. THE OKAPI-BOOK IS OUT THERE!